PHOENIX — Arizona’s rising temperatures are signaling that the summer heat isn’t far off and some residents are already eyeing area lakes, looking to hit the water. 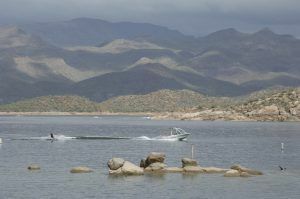 With that in mind, the Arizona Game and Fish Department reminds watercraft users that while temperatures may be warm, water temperatures remain between the 50s and 60s at many of Arizona’s boating havens. Even in a healthy person, cold-water immersion can impact muscle movement, breathing and a person’s heart rate. Prolonged exposure to the water can lead to hypothermia, cardiac arrest and death. If you fall overboard, climb back into or on top of the boat. If you cannot, stay near the vessel and use oars or anything floating nearby to help stay afloat. Life jackets aren’t just a good idea, they are required by state law for anybody 12 years old and younger when the boat is underway. There must also be at least one life jacket available for everyone aboard. To ensure watercraft users have life jackets available, the department has installed 15 Life Jacket Loaner Stations at lakes across the state including Lake Pleasant, Lake Havasu, Lake Mohave, Saguaro Lake, Canyon Lake, Apache Lake, Bartlett Lake, and Patagonia Lake. Boaters needing a life jacket can borrow one, use it on the lake and return it once done. Boaters are also encouraged to learn how to practice safe boating techniques and to respond in the event of an emergency by completing a boating safety course. To register for a free course or for more information on boating in Arizona, visit www.azgfd.gov/boating.